North Siders want the Garden Theater block to be developed. They just can’t agree on how to get there. Karen Dobrzynski takes a quick look out the front window of her Federal Street hot dog shop as she prepares lunch for a stream of customers. Across the street from Nana's New York Hot Dogs with windows boarded, stands a vacant building. At the corner, white paint peels from the brick facade of 4 W. North Avenue. Graffiti, visible from Nana's New York Hot Dogs, marks the side of nearby buildings. Five years ago when Dobrzynski, 54, of Castle Shannon, took over the 54-year-old shop with her husband, they thought speedy development was coming to the corner lots across the street from their shop. All plans for redevelopment, thus far, have fallen through. The nearly 150-year-old buildings at 4, 6 and 8 W. North Ave. in the Garden Theater block of the North Side once thrived with activity. Depending on the decade, the structures served as doctors’ offices, a bar, academic buildings and more. Today, they sit vacant. The only change in the last decade has been more decay. Options for the corner of the block are still being explored by Trek Development and the city’s Urban Redevelopment Authority [URA], said Chuck Alcorn, a senior project development specialist at the URA. Both preservation and demolition of 4, 6 and 8 W. North Ave. are still on the table, he said. The three buildings sit next to the Garden Theater building, which also has a lengthy history, once serving as a traditional movie theater before becoming an X-rated theater. Today, the theater is undergoing a historical redevelopment of its own. Residents on either side of the demolition vs. preservation issue for the three North Avenue buildings say they support mixed-use development of the block. They just need to agree on how to get there — by demolishing the buildings to expedite development or by developing only after there is a plan to preserve the building facades and their history? Disagreement among the community, legal battles and a carousel of developers have stifled promised redevelopment. In March, the Allegheny City Central Association [ACCA] voted to support demolition of 4, 6 and 8 W. North Ave. buildings. ACCA is a nonprofit, volunteer-driven organization working to enhance the quality of life for residents in Allegheny City Central, according to its website. Those who supported the motion to demolish said they hope it spurs action on the block. The URA, which owns the properties, did not prompt the motion, Alcorn said. Despite the vote, some residents say they want the historic structures to stay — even if that means development takes a little longer. Any action on the lots would require approval from several community and historical groups who serve as consulting parties in a memorandum of agreement [MOA] for development of the area. That process would be public, Dexter wrote. The MOA was formed in 2013 by the city, URA and the state’s historic preservation office because federal funds were being used to acquire some of the properties on the block, Alcorn said. It was later amended in 2014 as plans for development changed. The buildings each have stories of their own. They mean something to the community. “Wow, that’s just like taking out the heart of the North Side almost when you’re messing with that block,” said Bill Gandy, who runs the Allegheny City Historic Gallery with his wife, Kimberley. Gandy’s family has lived on the North Side for 120 years. He remembers going to the doctor as a child in one of the corner buildings. Eight W. North Ave. once housed the Apache Lounge, where he recalls his father taking black members of the Pittsburgh Pirates in the 1970s. Gandy looks past the crumbling facades and sees something beautiful: the history of the neighborhood. “The whole block was just amazing and that’s etched into all of our memories,” said Gandy, 50, who chronicled the buildings’ history on his website, northsidehistory.org. Steven Winslow, 32, who moved into a more than 100-year-old North Side home in 2014 started an online petition to save the three buildings. The Change.org petition, supporting preservation of the facades of 4, 6 and 8 W. North Avenue, has received nearly 900 votes in the last four weeks. 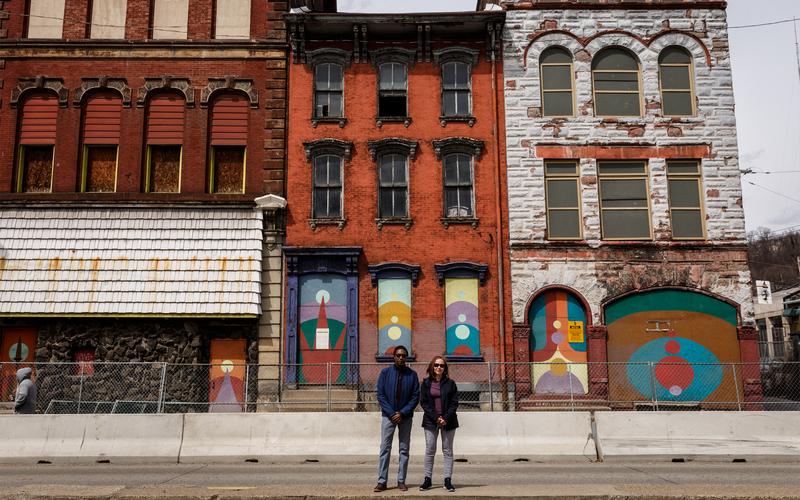 When he learned about the vote to support demolition of 4, 6 and 8 W. North Avenue, Winslow and his wife, Krista, began researching the history of the buildings – just like they did for their own home. What they found was “fascinating,” Winslow said. Sarah Carson, an “early feminist,” lived in 4 W. North Ave. in the late 1800s and early 1900s. She, not her husband, owned a hotel in Allegheny City, which is now Pittsburgh’s North Side, Winslow notes. She and her husband got into a dispute over the ownership of the property and their court battle made it all the way to the state Supreme Court, which ruled that Carson, not her husband, had the sole right to the property. At 8 W. North Ave., the Reformed Presbyterian Theological Seminary once owned the building. It later served as an academic building for Western University, which today is known as the University of Pittsburgh. One of the first black graduates of Western University in the late 1800s attended classes in the building. More recently, the buildings housed bars, doctors’ offices and hot dog shops that operated from the buildings. Winslow plans to present the online petition to the URA and to Pittsburgh City Council to show that not everyone supports demolition of the buildings. “When I walk by them, I want to see them restored to their former glory,” he said. Winslow has met with Trek Development Group, which has sole development rights for the structures, to find out what needs done to save the structures, be it grants or funding. He’s waiting for more details. Trek did not respond to PublicSource’s requests for comment. The URA has been working to restore the block for nearly two decades. The authority has invested money into stabilizing the structures for safety reasons, Alcorn said. He didn’t provide a dollar amount for how much has been spent to develop the properties or how much it would take to redevelop them. In 1996, a master plan was developed for the block by area organizations including Central North Side Community (now the ACCA) and the Mattress Factory, Alcorn said. It was after that that the URA began acquiring buildings on the block. That occured in segments, Alcorn said. 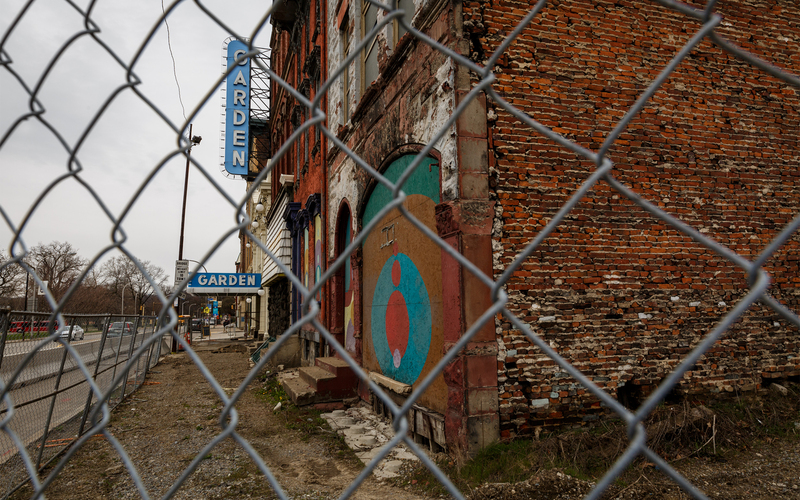 When the owner of the Garden Theater building wouldn’t sell to the URA, the authority went through a “lengthy court battle” for eminent domain of the property, Alcorn said. The URA entered a sales agreement to purchase the Garden Theater building in 2007. That served as a “launching point” to prompt development of the area. Purchases of the other buildings on the block followed, along with a request for proposals [RFP] for a developer of the block. Several developers have come and gone since then. 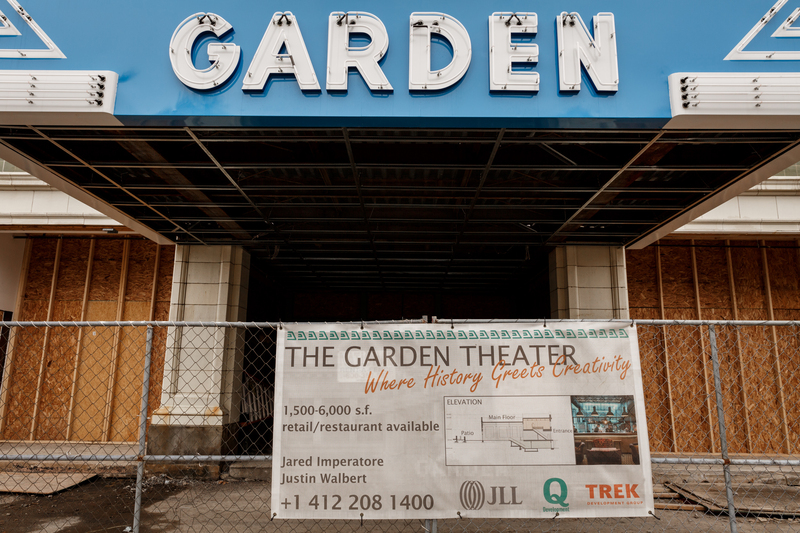 Trek Development and Pittsburgh real estate developer Q Development were given exclusive negotiation rights for the parcels on the block — all except the Garden Theater and the Masonic Hall buildings, following an RFP submission in 2014. Q Development is working in partnership with Trek. The Garden Theater was purchased by Trek separately, and it is currently undergoing a historic renovation. Trek is seeking a tenant. Some development has occurred in the block in the last decade. That includes the Bradberry building, which is being turned into an apartment building by Trek and Q Development, and the City of Asylum @ Alphabet City, which touts itself as a hub for Pittsburgh’s readers and writers, music performances and artistic experimentation. Trek had planned to redevelop the corner lots. However, a zoning snafu that ended in Commonwealth Court killed the plans for mixed-use development there. That plan would have saved the facades of 4, 6 and 8 W. North Ave., while building a multistory apartment complex in the rear. Businesses were planned for the ground level. Some said that was the perfect plan. However, two property owners challenged a ruling by the city's zoning board in 2015 that would have allowed Trek to build an eight-story, mixed-use development at the corner lots. They stated the developer did not prove that the plan would not alter the character of the neighborhood. Located in a local neighborhood commercial zoning district, the properties combined have a height restriction of three stories. “We’re terribly disappointed,” said Karamagi Rujumba, director of development and communications for the Pittsburgh History & Landmarks Foundation. “We do not want to see these buildings demolished. We think they’re important buildings. We think they contribute to the character of the North Side. 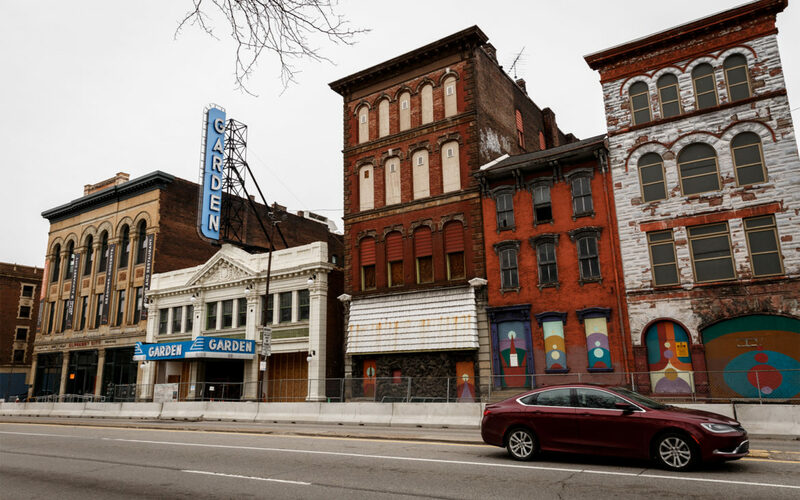 Preservation Pittsburgh supports preservation of the North Avenue buildings and is working on a letter to the URA to outline its concerns, Melissa McSwigan, the group’s director emeritus, wrote in an email. For future development plans, Alcorn said, Trek Development Group could combine the corner parcels with the Garden Theater site to increase the approved height to five stories. If the Garden Theater parcel is not combined with the corner lots, the limit would be around three stories for development, he said. 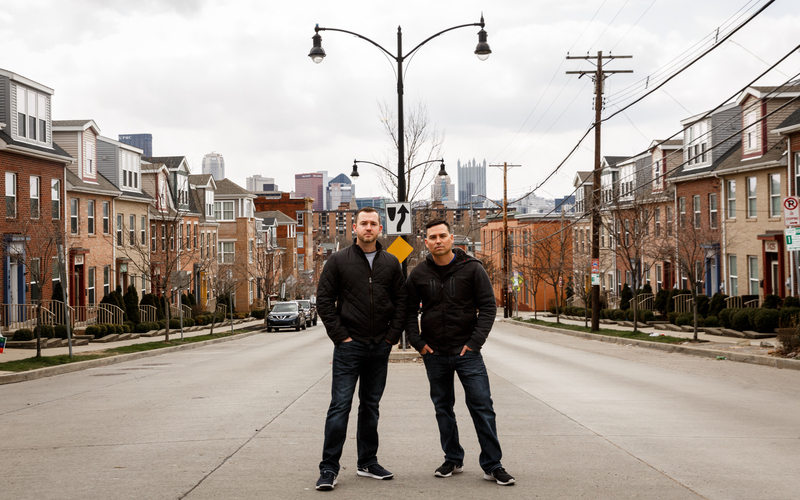 Husbands Jeff Brizek and Craig Reinhard moved to the North Side because of its prime location and affordability. In the summer they can walk to Pirates games at PNC Park or take a stroll downtown. And it’s a short drive to get just about anywhere in the Greater Pittsburgh region from their Federal Street townhome, which was built in 2012. One of the selling points that drew them to purchase their townhome was the new development that was supposed to be built a few blocks down the street. For Reinhard, the crumbling buildings pose safety concerns. The structures don’t look stable, he said. “At the end of the day, if you don’t feel safe walking down the streets in your own neighborhood, what are we doing here?” he asked. Brizek, who walks to the gym in the new Nova Place when it’s warm, said he sees the same people loitering on the sidewalk every day near the buildings. He’s watched drug deals go down, and knows there’s even the occasional shooting nearby. He sees development of the block as a way to clean up more than just the buildings. What frustrates the two is that every time development starts to move forward, people crop up with ways to stop it. The neighborhood sometimes gets in the way of itself, Brizek and Reinhard said. “I hope that future developers don’t shy away from us because they see time and time again that when our community gets involved, things just don’t happen for us,” Brizek said. Maria Rose fact-checked this story. I know I’m a little late to the party but these dudes are EXACTLY the reason some minorities hate when white folk move to their hoods. So the loitering bothers you and the (assumed) drug deals are an issue to you? I am sorry, you moved into a neighborhood and then you want the denizens of said neighborhood to change for YOU? Correct? I’m originally from NYC, lived in Brooklyn for years in some “rough areas”, I didn’t care, I didn’t go and make a stink cos people loitered, smoked weed, sold weed, etc. I had grown up in a cute part of Queens (Astoria) and yeah, that scene was different but I didn’t go around stomping my feet demanding my hood or it’s people change cos of my sensitivities. I’m Hispanic for the record, but I live and let live and if you don’t want to step on people’s toes, you adapt or assimilate, especially when you’re the newcomer. These guys are ridiculous. I am all for The Garden being preserved or redeveloped but they should do EVERYTHING possible to at least maintain it’s facade and definitely not be more than 3 stories tall. Surely whatever is salvageable, you can repurpose in its redevelopment so it can maintain its true essence. You want it to maintain a part of the neighborhood’s history and you want it to fit in and not stick out like a sore thumb like some of the newcomers in the area. Discussions about what to do with the Garden Theater and the buildings around it have been ongoing since at least the late 1980s if not before. I think one thing a lot of people need to come to understand is, old does not necessarily equal historic. Another is, consensus is a nice goal, but achieving that is often a real roadblock to sensible, economically feasible, expeditious development. Set a time line. Decide what is to be achieved and let the property owner select a architects and a developer to accomplish that goal. It would be a tragedy to demolish those buildings. They have an archetechual beauty that does not exist in today’s concrete slab structures. PRESERVING THOSE BUILDINGS SHOULD BE THE UTMOST PRIORITY OF THE URA. Thanks for the thorough article on this subject. The saga is now more than a decade old, if I’m calculating correctly. One thing I haven’t seen from either government or private investors: an honest estimate of rehab costs for these buildings. What does it really cost to make them commercially viable?